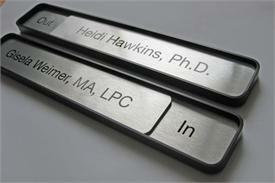 For demanding professionals - Our 13"W x 2"H changeable message sliding office signs include a unique brushed metal name plate that slides left to right uncovering a changing message of your choice. Simply add the custom text in the Personalization Fields below - at no extra charge. Also, the lower nameplate with standard "In Session/Available" can be custom text of your choice, for example "In/Out" or Unoccupied/Occupied", Unavailable/Available, etc...ideal for office door signs. Personalize this architectural-quality sliding office sign for medical office signage, doctor's offices, meeting rooms, hospital waiting rooms, personnel nameplates or whatever you need. - Ideal sign to display the availability of any person, employee or room. Personalize your top sliding plate text here - Customize 1 sign or up to 5 signs at a time, and adjust the Quantity box accordingly. Please indicate "BLANK" if slider plate is to remain blank. Personalize the availability portions of your sign here (i.e. In Session/Available, In/Out). Please indicate "BLANK" if any portion is to remain blank.